So this got us thinking about what a problem like this was doing in the multiple choice section of the test, if it wasn’t designed to be a computation task. And we thought about how string work could — in theory — support a student to solve this problem. And here solving means really reasoning about answer choices C or D, not actually calculating. And so this called for a new set of strings where kids continue to develop a sense of how these numbers relate to each other. If our earlier work with strings has begun to solidify — and we as teachers help it to solidify by naming and posting ideas, claims and generalizations that we, as a class, agree are true — then we can use what we know about 10% of a number to estimate what 12% of a number would be. 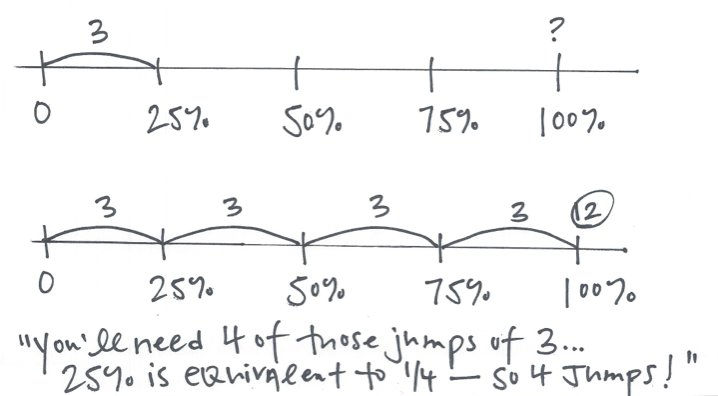 So here’s our attempt at a new form of percent string, that would support a student to solve that multiple choice question when the time comes. We encourage readers to write some more that we will gladly post and share. 3 is 100% of what number? 3 is 50% of what number? 6 is 50% of what number? 3 is 25% of what number? 6 is 25% of what number? 3 is 10% of what number? 6 is 20% of what number? 3.8 is 10% of what number? One teacher decided to end the string with the original multiple choice question, asking his students to show their reasoning with model or defend it in words. He passed it out on paper and asked kids to solve the last problem in the string on their own. Ending with some kind of independent assessment of student learning is always a nice way to go. Kara, you are a genuis! I’ll add your string to my collection! Paul, we’d love to know how your work with strings is going in St. Louis. Write a post when you are ready! I like the double number line method – I hadn’t seen that before.